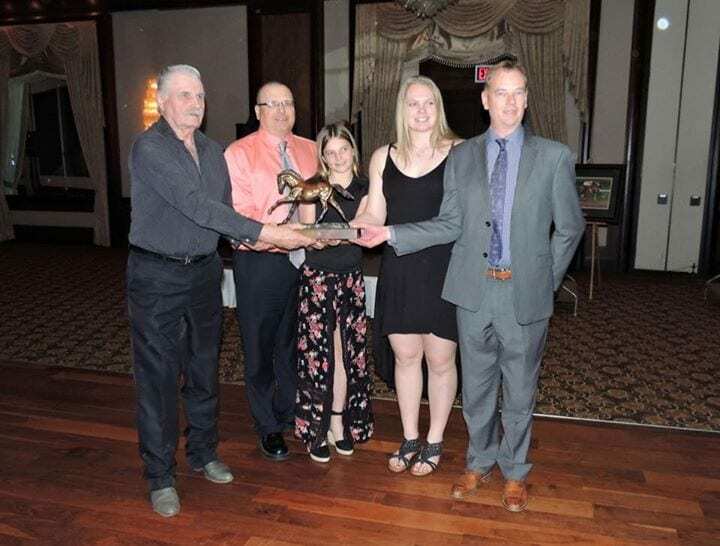 The successes and accomplishments of the Alberta Thoroughbred industry stars of 2017 were celebrated this past Saturday evening at the 44th annual Night of Champions held at the Chateau Lacombe in Edmonton. Over 175 industry members took part in the evening event including breeders, owners, trainers and representatives from the Alberta Owners and Breeders Association, Century Casino, Canadian Thoroughbred Horse Society (Alberta Division) Horse Racing Alberta, Northlands and Olds College. Dinner was followed by a speech honoring, in memoriam, the tireless champion of the Alberta Thoroughbred industry champion, Lynn Chouinard, given by close friend Max Gibb. A video celebrating the industry was next on the program along with the presentation of the Thoroughbred awards. The 2017 champion Alberta-bred and 2-Year-Old colt title was awarded to Shimshine, winner of four races and earnings of $110,911 in his first season on the track. The Wilko gelding is owned by White Pine Ranch and was bred by Wally Pugh and Andy Stronach. Trooper John was awarded the title of 2017 Horse of the Year for a season that included three wins and earnings of $138,900 for owner Riversedge Racing Stables Ltd. The Pennsylvania-bred gelding is by Colonel John and was bred by Smart Angle, LLP. The 2017 Ken Cohoe Lifetime Achievement Award and Horseperson of the Year title was awarded to Ken and Maxine Anderson to reward lifelong personal involvement and contribution for the love of the Thoroughbred. Jean Kruse, CTHS Alberta Manager, addressed the audience highlighting the contributions of Ken and Maxine and their immense value especially as mentors for people new to the Thoroughbred industry. Theresa Sealy accepted the award on behalf of Ken and Maxine who were unable to be present. The 2017 Special Appreciation Award in recognition of exemplary services to the Thoroughbred industry was awarded to Lynn Chouinard in memoriam and accepted by his daughter, Jennifer Mundy. This entry was posted in People and tagged alberta night of champions, Alberta Owners and Breeders Association, alberta thoroughbred racing, CTHS, CTHS Alberta, horse racing alberta by Press Release. Bookmark the permalink.